When Spiriva was released, the official statement was that Ipratropium might compete with Tiotropium and, being less potent, decrease its benefit. The trials were done comparing the two but no add-on effect was measured. The PI actually states: "However, the co-administration of SPIRIVA with other anticholinergic-containing drugs (e.g., ipratropium) has not been studied and is therefore not recommended." Our pharmacy interpreted that all Pts started on Spiriva should have Atrovent discontinued and Combivent switched to albuterol. How have you handled this? 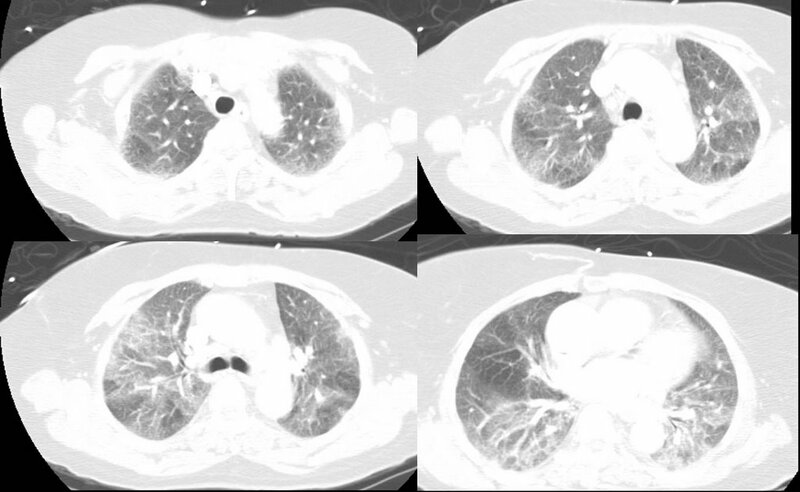 We see a lot of pulmonary nodules here in TN. 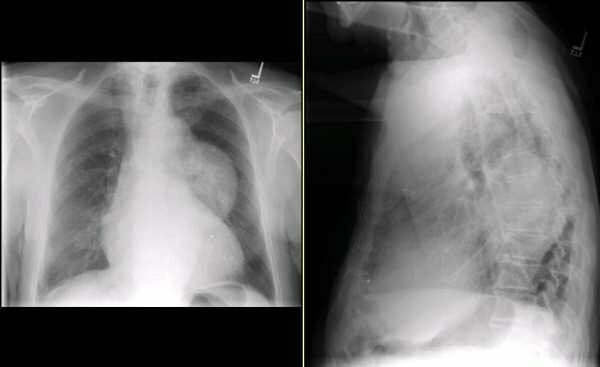 This is a man in his late 60s with severe COPD (FEV1~40%) who had some nodules on his CxR. He had a CT scan done and has 2 main nodules on the right (pictured) and a very small one (not pictured) on the left. His bronch was non-diagnostic and his PET was negative. Would you pursue this any further or just watch? I thought it would be fun to highlight some of the previous cases. This is also useful because occasionally we'll get a comment long after the case was posted so it may get lost as new cases bump the old ones back. Recently there was some interesting discussion about the treatment for IPF. There was the article on Acetylcysteine and pulmonary fibrosis (IPF). More often than not, we read a high impact journal and take what it finds at face value. As busy physicians we might not have the time or patience to read an article critically, and we sometimes "trust" that the peer reviewers read it critically for us. This may be especially true in a high impact journal like the New England Journal of Medicine. It seemed like a straight forward question: "where do I get acetylcysteine to prescribe for my patents?" But the comments highlight the fallacy of believing everything we read. As Jeff H pointed out, I think it's critical to point out that NAC was used IN ADDITION to Azathioprine and Prednisone. There are no trials that have evaluated NAC as monotherapy. Moreover, there was no "placebo" group included in the NEJM paper. So, there are NO DATA that oral NAC, as monotherapy, is any better (or worse) than nothing. Doug (and others) highlighted this, pointing out that NAC may have merely had a protective effect on the harmful effects of prednisone. And jgiustino's comments are interesting: All I can say is that this was a bad study! The data from patients that actually completed the study did not show ANY significant change in lung function between the two groups. The authors then needed to resort to "last observation carry forward" to show significance ....this is a highly controversial statistical method. I am very surprised that this has not been questioned by more people. I think that this study proved that NAC prevent bone marrow toxicity from imuran (they did not need "last observation carry forward" to prove this. All else is very suspect as far as I'm concerned and I wish they had the foresight to get a larger patient population into the study so they would not have to resort to such statistical games. The diagnosis of UIP can also be challenging. What's more important, a biopsy showing UIP or typical CT findings of honeycombing at the bases with minimal ground glass? What about a biopsy with UIP and previous CTs showing LOTS of ground glass? I posted a case where a patient had an open lung biopsy that was consistent with UIP but with chest CT's back 6 years showed that there has been lots of ground glass (and upper lobe to boot). My question was, does the biopsy trump the atypical CT findings, OR do the previous CT findings make us question the assumption that UIP makes the diagnosis of IPF? I'm not sure the question has been adequately answered but the comments shed some light on the controversy. More than one pointed out that the diagnosis of UIP is also dependent of the pathologist. And if we have a diagnosis of UIP by biopsy, would we withhold treatment with immunosuppressives? What if the pathologist read it wrong and it is truly a steroid-responsive disease? One commented that this is also the best argument on why we should "treat" our UIP patients with a 3 to 6 month course of prednisone and imuran..not to treat UIP but to definatively rule out other treatable diagnosis." So the same research group showing that UIP trumps all other biopsy specimens (in terms of prognosis) also found that the dignosis of UIP is pathologist-dependent. In other words, if you are not at a major university specializing in IPF, ignore the biopsy report and treat everyone with prednisone for 6 months to see if they get better! But seriously, it sure is strange that a pathologist would have difficulty with the diagnosis. After all, all you need is a biopsy showing fibroblastic foci, areas of normal parenchyma, areas of fibrosis and honeycombing in the periphery, and a paucity of inflammatory cells. What's the problem? 43 yo male with minimal PMH presents with 1 year history of constitutional symptoms (lethargy, intermittent fevers, and RUQ pain. Was diagnosed with elevated transaminases, but a cause (to date) has not been determined. 3-4 weeks ago, became progressively more dyspneic. Initially noted with moderate amts of exertion, but now is at rest. Denies any cough, sputum. Has some pleuritic CP. Still having intermittent fevers, chills and sweats. Basic labs normal except AST and ALT in 400’s. They have not appreciably changed in 6 months. 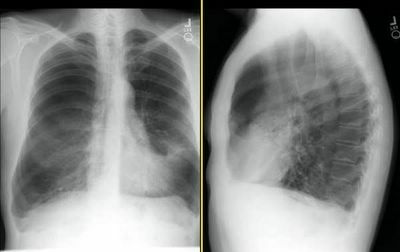 The CXR showed interstitial pattern; to save space, I will not include it. Most would have gotten a CT in f/u anyway. We are starting to prepare for the ATS poster (abstract on this site). We would like to learn more about people who visit pulmonary roundtable. If you haven't done so, please be so kind as to fill out this very short survey. The CxR did not project the RUL lucency as well as I hoped... Jennings pointed out some of the density increase in the left: he does have some scarring throughout but the left side looks denser because of the right lucency. Check out his CT scan. Answer below in the discussion. Hopefully this CxR will project fairly clearly. This is a 70 y/o man who finally quit smoking and has significant DOE. 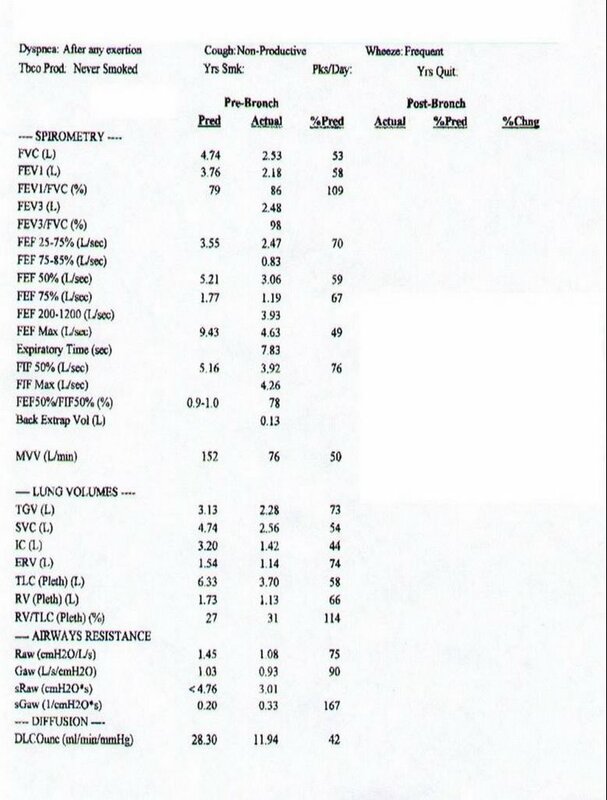 His PFTs on bronchodilators show some hyperinflation, very reduced DLCO and FVC~60% with FEV~33%. What do you think of his CxR? This is the Radiology Wednesday posting by Arenberg from last Wednesday. Check out the answer below. Interstitial fibrosis predominantly distributed peripheral subpleural areas of the bx. Also multiple foci of active fibrosis. Also foci of reactive pneumocytes and expansion of some of the airspaces with incipient honeycomb formation. Occasional foci of mild non-specific chronic inflammation and also foci of alveolar cells/macrophages within airspaces. 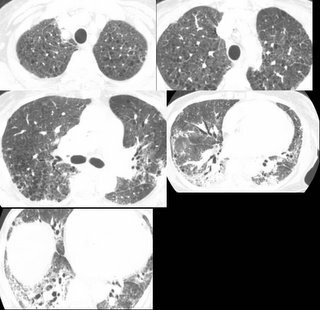 Areas of normal lung parenchyma interspersed within the fibrotic foci. No granulomas. Grocott stain negative. 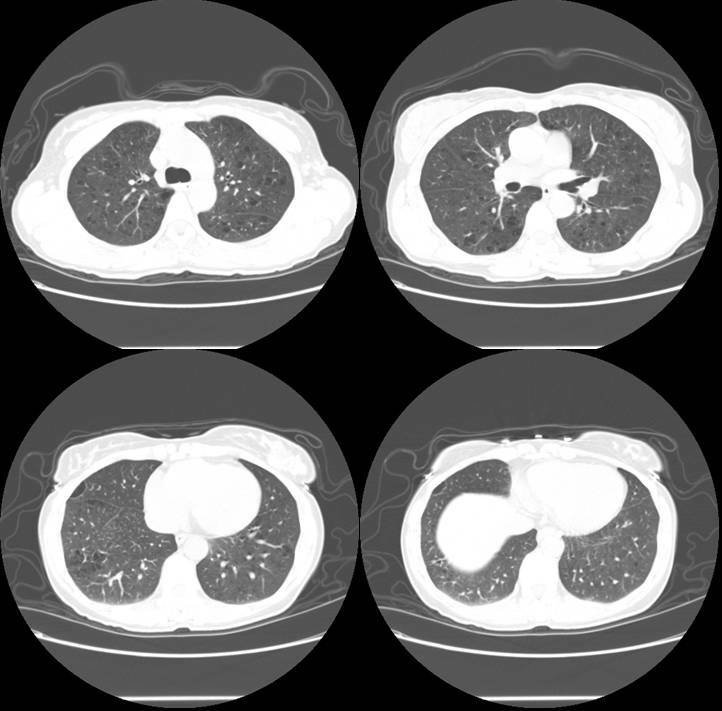 The overall histologic picture is in keeping with usual interstitial pneumonia (UIP). 1999: "Multiple patchy opacities in the right upper lobe with one more nodular appearing opacity seen on images 16-18 are of uncertain etiology. Scattered unenlarged lymphadenopathy and one single borderline enlarged subcarinal node is seen. Inflammatory ( BOOP, MAI, etc. ) cause is more likely but malignant etiology should be excluded. 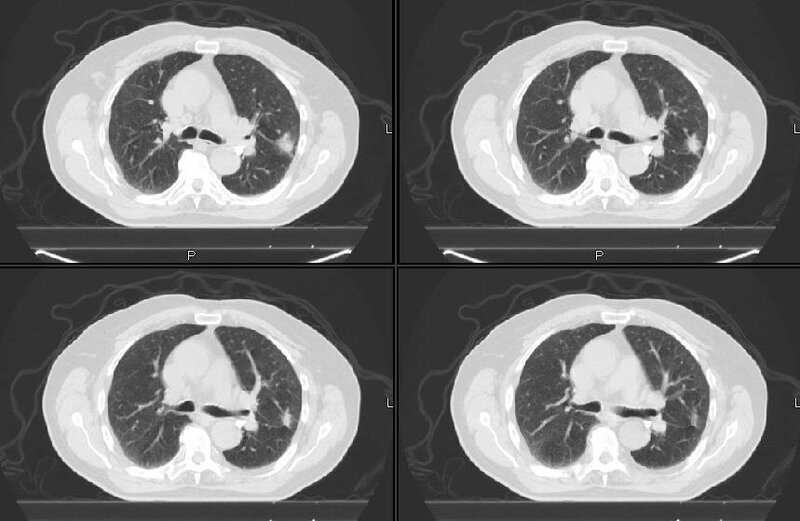 later in 1999:Multiple patchy & nodular lesions completely (or nearly) cleared. Several ill-defined opacities remain. Resolving inflammatory disease is suspected. 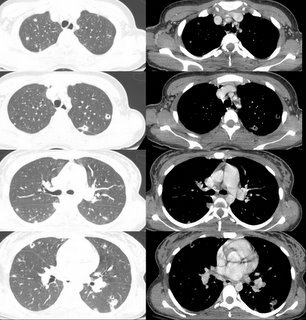 Multiple non-enlarged mediastinal LNs, including AP window, low right paratracheal, right tracheobronchial, and subcarinal lymph nodes, are unchanged. 2002: Thickening of the interlobular septa and honeycombing peripheral and basilar distribution. 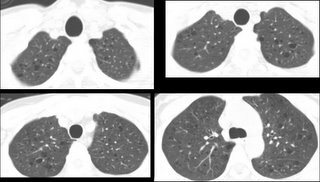 In addition, bronchiectasis is present in the lower lobes and ground glass appearance persists, more predominant in the lower lobes. So we have a biopsy with "UIP" (RML and RLL open lung, done after the above HRCT and after a nondiagnostic bronchoscopy). Is anyone bothered by the previous CT's suggesting an inflammatory look to it (i.e. ground glass)? In my opinion this is a previous inflammatory process (perhaps NSIP, BOOP, HP, etc) that has progressed to fibrosis; do you feel that the biopsy showing foci of fibroblasts represent true idiopathic IPF? 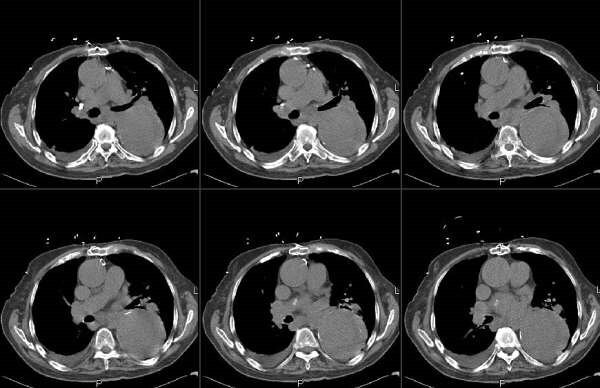 This 50 y/o AA woman presented with shortness of breath. 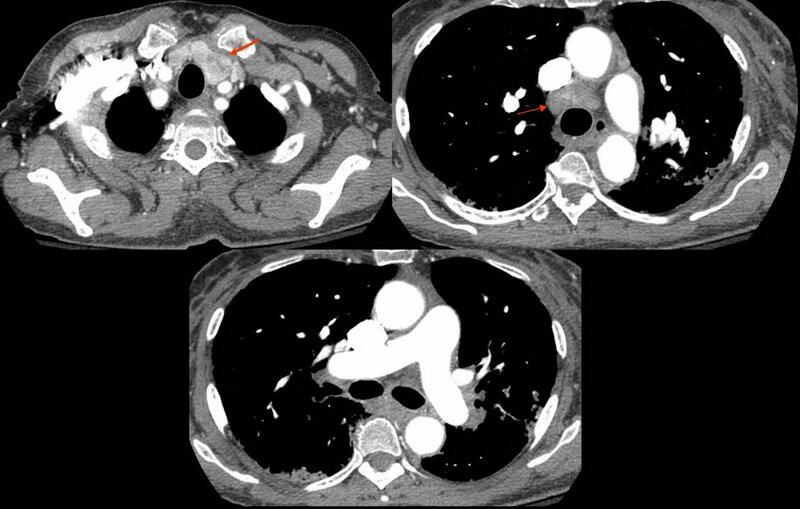 Without further history, what would be your (not necessarily complete) DDX based on the CT. Also note the mediastinal nodes (arrows). The work-up for this case is ongoing. A colleague of mine is the primary care giver. 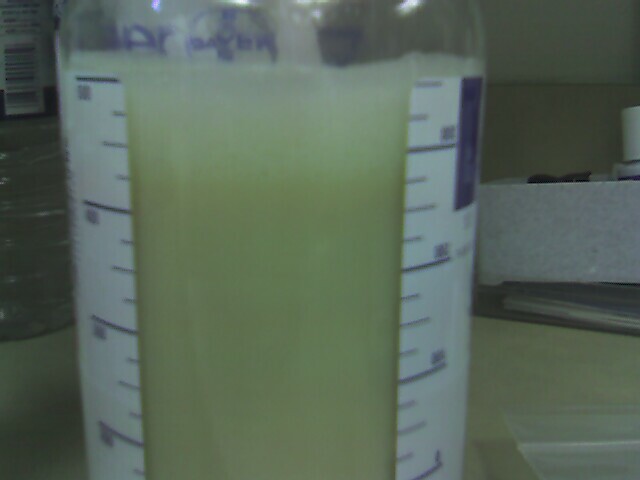 This patient was referred for an effusion that turned out to be chylous. The biopsy is quite interesting. 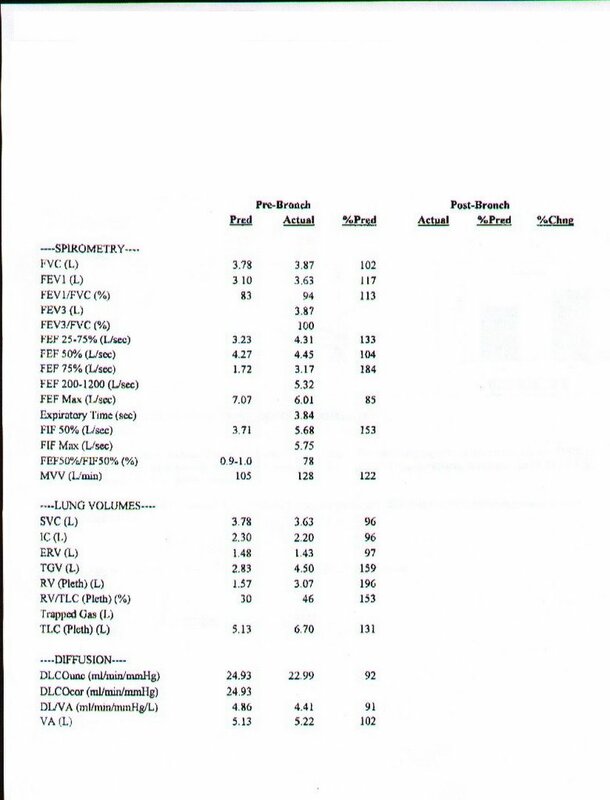 Here's the report: The biopsy contains no normal tissue. All sections contain confluent non-necrotizing granulomas with patchy associated lymphocytic infiltrate. Per the accompanying report, special stains are reported to be negative for fungus and acid fast bacteria. What are your thoughts about what's going on, and how would you proceed next? There are no "right" answers yet as the workup is ongoing. All comments are helpful. 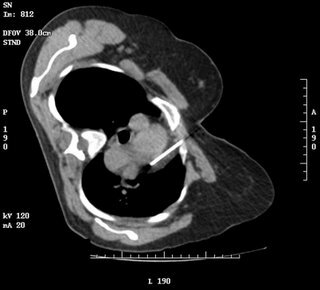 Quick case: a 55 year old woman was diagnosed with Sarcoidosis in 2000 based on a biopsy of a skin lesion. At the time, she was referred to my institution where saw a young, but talented fellow (CEOB). She had mild bilateral hilar adenopathy and some atypical diffuse interstitial markings. The biopsy was reviewed and the diagnosis confirmed. She has never received any treatment for sarcoidosis, and her pulmonary function remained normal for 4-5 years. Co-morbidities include: asthma and fibromyalgia. I began seeing her about year ago (after a second fellow who took over many of CEOB's patients). 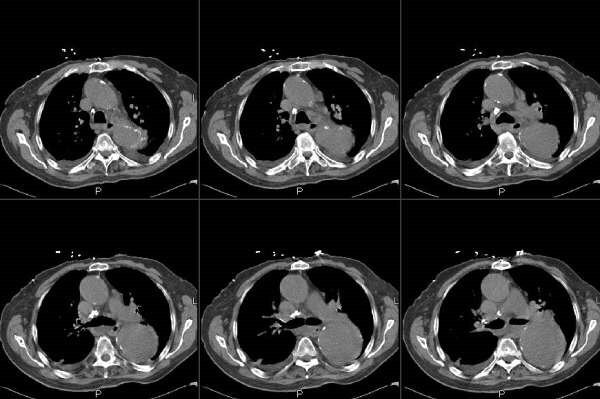 The first time I saw her, she had a new complaint of persistent chest tightness and a marked decline in her pulmonary function: DLCO decreased from a stable baseline of 77% to 60%. FEV1 and FVC dropped from 82% and 86% of predicted values to 72% and 74% respectively. lobe, and right upper lobe, the latter associated with atelectasis. 2. 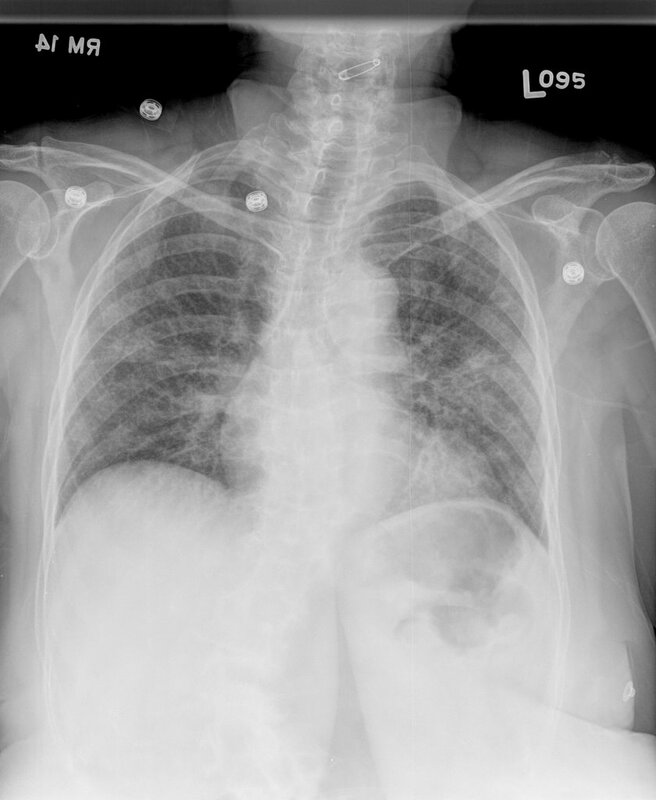 Increasing parenchymal nodules, predominantly in the left upper lobe. 3. Stable mediastinal and upper abdominal lymph nodes. We discussed bronchoscopy and immunosupressive therapy for treatment of sarcoidosis, but she was very resistant to therapy and we chose a "watchful waiting approach." 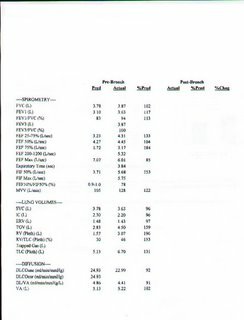 In follow-up (after 3 and 6 months), she has had consistent improvement in her pulmonary function, so that her FEV1, FVC, and DLCO are now the same (or better) as they were in 2000. She continues to complain of some persistent chest tightness, but otherwise feels much better and is not limited in any activity. 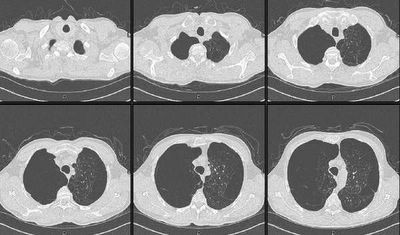 1)Would one treat for radiographic progression of Stage 4 sarcoidosis in the absence of a decline in pulmonary function? 2)Do you think that the persistent "band-like" chest tightness is related to either her sarcoidosis or to asthma? Check out Doug's case below. 'Can't hide anything from these smart people. 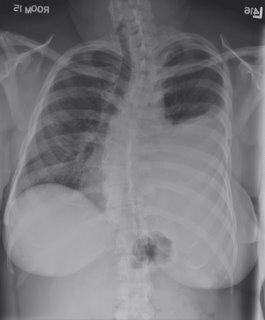 We were called by one of the cardiologist for this abnormal CxR. 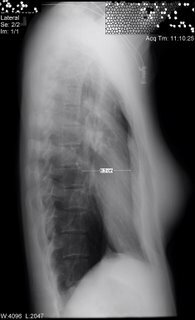 How would you approach the radiographic abnormality? 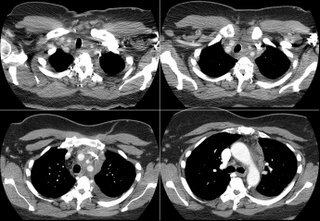 This is a contrast chest CT. What's the differential diagnosis? 38 yo female with no PMH except A1AT deficiency diagnosed in her 20's when she was being worked up for abnormal liver tests. Her level then was 21 mg/dL (normal > 80). PiZZ phenotype. Her PFT's (spiro only) in 1989 were completely normal per a dicatated report by a pulmonologist practicing at a now-closed hospital. The pulm specialist is now retired. She was not treated with enzyme replacement. She was referred to me after her PCP rechecked the level and again confirmed 21 mg/dL. She feels well, exercises 5 days per week without any dyspnea. She has not had a resp infection since she was in her teens (when she smoked for about 5 years...1/2 ppd). She has no limitations. Labs: AST and ALT in 50's. O/w normal (except A1AT level). If not, how would you follow and what would push you to treat? 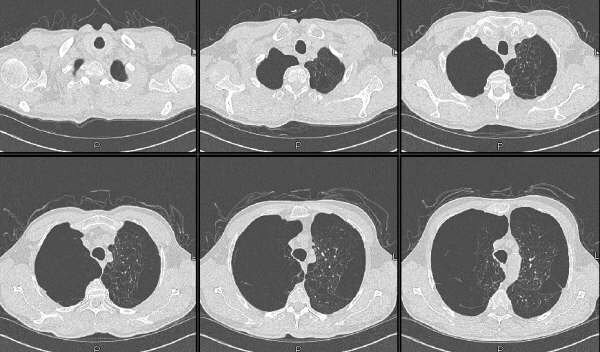 Would you offer inhalers to this asymptomatic patient? 66-year-old Arabic woman who had 3-4 days of shortness of breath. No fever, chills, or sweats. Her review of systems is negative except for some intermittent swelling of her knees. Past medical history: hypertension and moderate left ventricular hypertrophy seen on an echocardiogram, but negative cardiac stress test. On physical examination, healthy-appearing woman, BP 144/66, heart rate 60, respiratory rate 20. Lungs reveals of inspiratory crackles that are fine and without course crackles. There is no lower extremity edema and reveal no finger clubbing. PFT's: TLC 57% with a DLCO of 50% predicted. Dobutamine echo: no wall motion abnormalities. EF 55-60%. BNP when she came in with SOB was 24. There was no improvement with diuresis. Transbronchial biopsy: peribronchial tissue with single poorly-formed granuloma. Lung parenchyma with focal type II pneumocyte hyperplasia. The survey link is working again. Please take the time to fill it out so we can better understand your needs! Here's a "unique" way of sampling a mediastinal node. I tried to prescribe acetylcysteine for pulmonary fibrosis, based on the recent article suggesting some benefit. I was called by the pharmacist who had never heard of it in PO form. The article by Demedts in NEJM 11/2005 used 600 mg PO tid. If the average pharmacist is unable to find any info about the drug, it makes me wonder what to do next. Has anyone been able to find a pharmacist who is familiar with this rare and magical medicine? I didn't know PO was such a strange route. Isn't that what we give for acetaminophen overdose? Here is a very sad case. 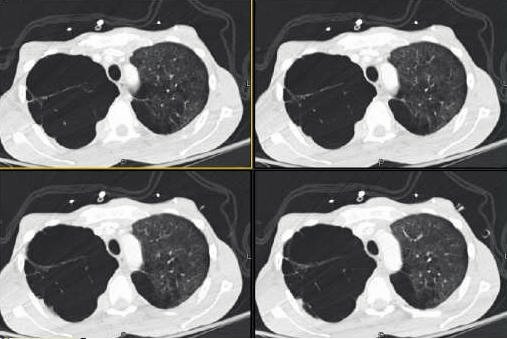 This is a 29 y/o man with a long Hx of TOB use who was diagnosed with stage IV lung Ca last September and had been given Chemo at the time. He now presents with dyspnea and bone pain. I have posted some films below. Have you seen such a dramatic presentation at this young age? Would you work him up for any other conditions that may have led to this aggressive disease course? This is the 83 y/o man with an abnormal CT scan sent to us by the CT surgeons. This posting had generated some nice discussion on how to approach these octogenarians. His bronch was non-diagnostic and his PET was actually negative (very low uptake to the mass). 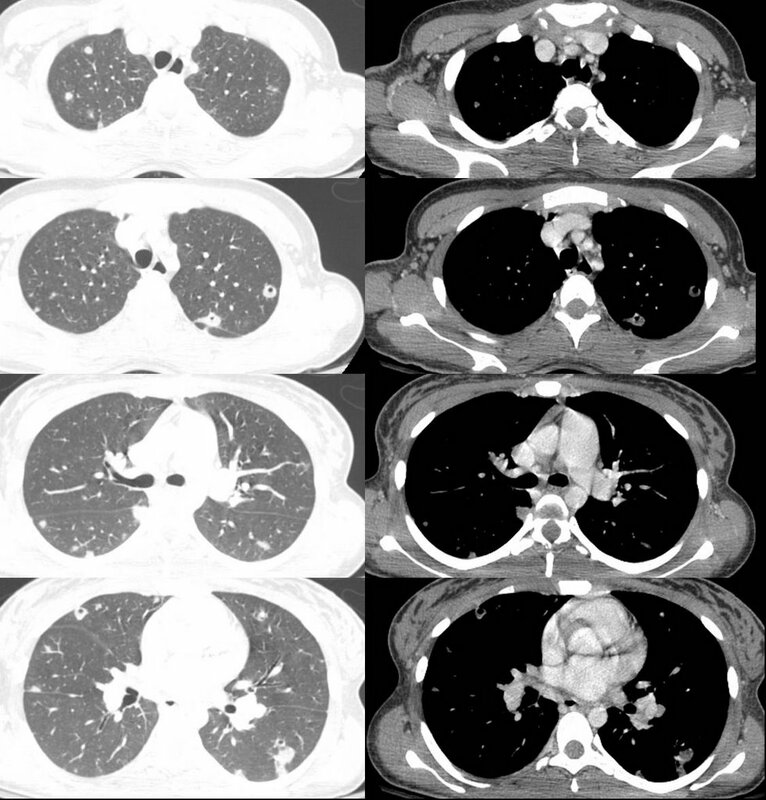 We did a repeat CT scan 3 months after the original one and the lesion is unchanged: no calcification, no improvement. 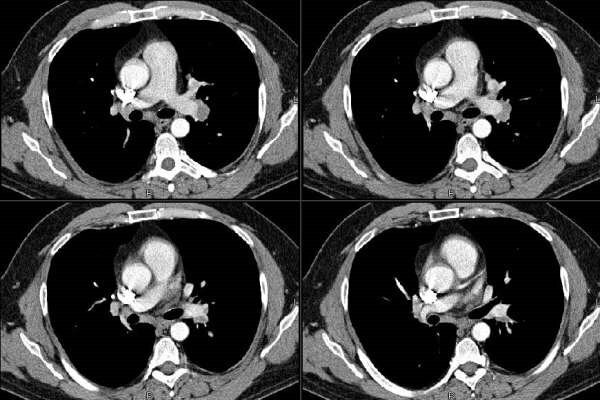 He is asymptomatic... What would you do next? lymphopenia, and some alopecia. She also has leukopenia. She has no respiratory symnptoms. A routine CXR followed by a high res CT are shown below. very mild chronic inflammation and intra-alveolar hemosiderin laden macrophages. These findings are non-specific. Also present is a fragment of epithelium and scant fibrous stroma with a papillary configuration. A patient with an FEV1 of 400 cc, steroid and O2 dependent, vented for 55 days after respiratory arrest due to pneumonia. 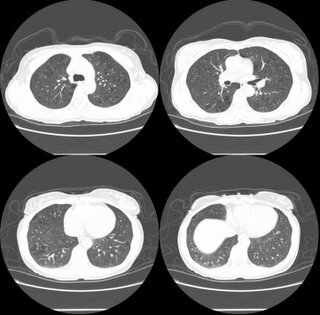 He's a former smoker, relatively young (mid fifties), and the workup for his early onset COPD was unrevealing. He does not have any other significant comordities outside of the psych issues you'd expect after two months on a vent. He's trached, but weaning has been very difficult. He generally fails weaning attempts due to a shallow and rapid breathing pattern. I was wondering if anyone has experience with weaning in patients undergoing prolonged mechanical ventilation. Hoping to generate some discussion about the slow SIMV wean published by Scheinhorn, or the use of NIPPV to wean patients with a trach. Quinnell's article in the January Chest showed a surprisingly high success rate with a mean FEV1 of approximately 600 mL. Any other ideas for weaning in this type of patient population? 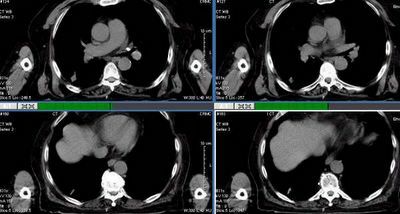 40 yr old Female dx 7 yrs ago w/ stage 4 multifocal bronchioloalveolar carcinoma - all 3 right lobes involved. NED in left lung. Standard chemos-no effect. 6 years ago she underwent right pneumonectomy. 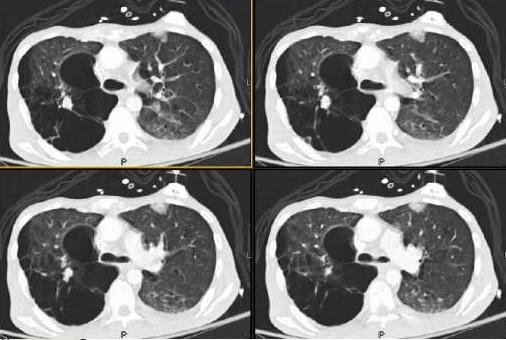 Eight months later recurrent disease was diagnosed with multifocal nodular ground glass opacities in both lobes of the left lung. Started Iressa and later Tarceva. Initial partial regression, followed by periods of slow growth and stability. Previously, on PET only the largest nodules show abnormal uptake, and then very mild. On recent whole body PET/CT, very slight growth of a few nodules in the left lung noted, the rest stable, and corresponding low level FDG uptake in the larger nodules (max SUV 3.2). However, for first time, lymph nodes in the hilar region and mediastinum showing intense FDG uptake (max SUV 26.7)and the left paraaortic lymph node adjacent to the crura (max SUV 30.1.). 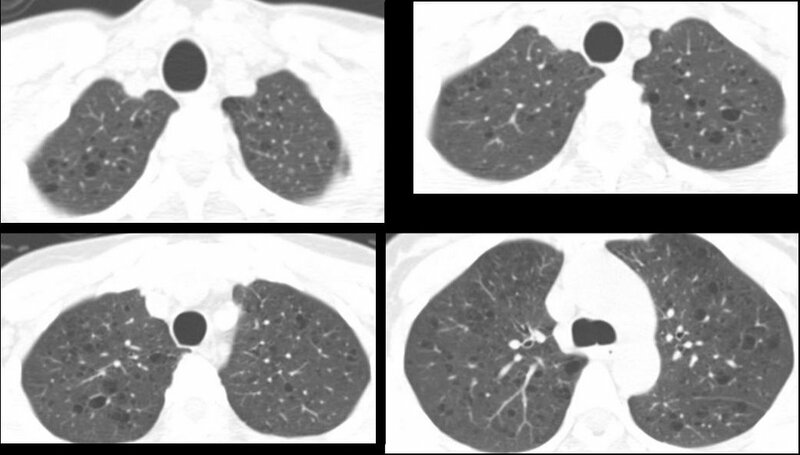 Has anyone seen this in bronchioloalveolar carcinoma with a prior indolent course? I recently posted this CT with B/L adenopathy and got good comments/suggestions. Keena and JCH pointed out the same concern I had for TB or atypical infections in someone on Enbrel. I chose to do a bronch to rule out those possibilities. TBBx showed some mucosal chronic inflammation. Cyto and BAL revealed a predominance of CD4s over CD8s and no infection. I have been comfortable calling this sarcoid and following him along. He does have some airway hyperreactivity and his atypical CP has resolved on an ICS. Would you do anything else on his eval? 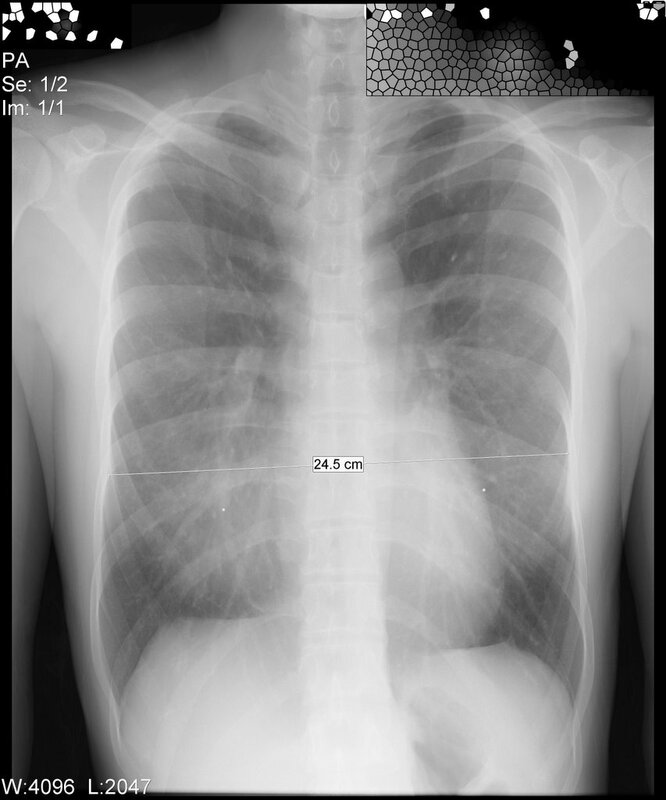 This is a 29 year old woman who presents with a complaint of dyspnea while running. She is otherwise completely healthy and never has had any medical problems. However, she did note some epidoses of episodic dyspnea as a child. She describes her physical activity as mostly sedentary until the last three years of her life when she took up running. Recently, she has been trying to increase her mileage in preparation for her first marathon. She can run about 5 miles at a time now, but will often have to stop at about 2 miles because of dyspnea. She states that she has not been increasing her pace. 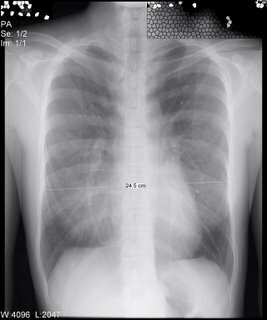 What abnormality does this CXR suggest and how would you proceed? 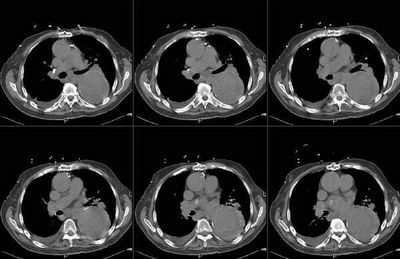 49 year old woman with a year of dyspnea on exertion. She came to us for a second opinion. She was diagnosed with sarcoidosis approximately 12 months ago. No biopsies and radiographs not available. Chlorthalidone, Metformin, Tamoxifen (don't know why) and prednisone 5 mg QD. She is a lifelong nonsmoker. On exam, she has a very large goiter, and dullness to percussion over the left chest.